While the build team assembles the robot, we are updating our models to the last minute changes that the build team is making. Most of the model is actually up and running, so the changes that we are making are minor ones, such as updating where certain holes are cut in the c-channel, where rivets and certain parts are bolt in, etc. We are also beginning to assemble some of the more advanced parts like the chain and the electrical board. They aren’t completely done as of yet, but the chain is well under way. We have also been making several renders for the media team’s weekly vlogs. Besides the main robot, the CAD team is also well invested in the mobile museum project. This week, we have been working to make our ideas and general concepts, which were hashed out weeks ago, into real models. As of now, the drive bases are complete and the structure for the game-piece handling is set. We have also started constructing and designing the mechanisms we will use. We are also designing the field we will use, focusing particularly on the center goal and the exterior boundary. We will continue into the sixth and seventh week to finalize our model and to complete the mobile museum project. Beginning our week later than usual on Tuesday, we started pretty slow. We worked on creating scenes in After Effects for the Pneumatics Mobile Museum video. Also, we bought a new light and played around with its setup. On Wednesday and Thursday, we got right down to work and started filming for the vlog and editing shots of the construction of our robot, which is looking spiffy. Unfortunately, our meeting on Friday was cancelled due to the impending weather; however we continued to work on Saturday. On Saturday, we set up our light kit and green screen and finally started filming for the Mobile Museum! We also hosted tryouts for members who were interested in becoming the anchors for our videos. As always, we are continuing to film the robot as it comes together. If the robot finishes in time, we plan to create a robot trailer for all of the other FIRST teams to see. Design and Mechanical by Willow B.
Saturday: Today really felt like build season. The shop buzzed with so many people that it was difficult to move about (or maybe the buzzing was the power tools). 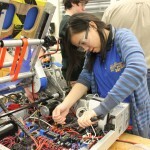 Two robot frames laid on the tables and the electrical team began filling them with components. Meanwhile, the intake and shooter construction continued as the robot began to develop. Various parts of the drive, like the gearboxes, began to come together. In Miss Daisy’s usual home-made fashion, the mill and the lathe were on constantly in an attempt to make all the specialized parts. Prototyping for our climbing mechanism finally began and the running prediction is that chaos is about to break loose; however, a killer robot will soon be formed.We are hoping to have a fully operational robot by the end of this week. Everyone is psyched! Tuesday: We continued building again today. The prediction still stands that we will have something resembling a robot by the end of the week. We still haven’t started prototyping a shooter. Today, we mostly worked on the arm and machining parts to fit everything together in order to get the main robot finally assembled. 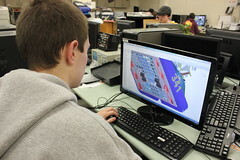 Wednesday: Today, we continued machining and working on the arm, trying to get the robot together. The mechanical team ran a test on the shooter (by successfully firing a frisbee that went across the shop and hit the already-battered lathe) and continued to mess around with getting the arm together. Thursday: By the end of the day, the arm was fully together. We decided to test the arm, but wound up breaking a motor instead. We are thinking that the robot should be close to assembled by the end of tomorrow, but we still haven’t attached the arm or even the shoulder. There is some fear that we will be put even farther behind by an approaching snowstorm. Friday: Today was the last official day of the fifth week, and our school was closed because of the approaching storm. There were no build hours today, and we still haven’t even driven our robot. We have an arm and a drive now, but with no shoulder to connect them. We still don’t have a climber prototype. The only thing beginning to climb here is our stress levels.